Dubspot teams up with Dub Champions Festival on June 19th for a special workshop with Adrian Sherwood + Mad Professor at SIR Studios LA, less than a block away from our new LA location. With special guest Jeremy Sole from KCRW FM. Hosted by Dubspot instructor Emch of Subatomic Sound System, founder of Dub Champions Festival and band leader for Lee “Scratch” Perry. 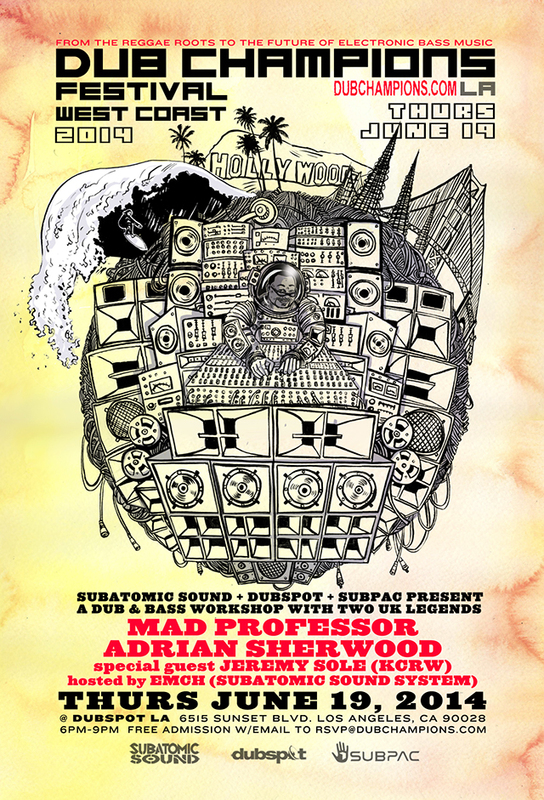 Dubspot + Dub Champions join forces for a dub music and culture workshop on June 19th, 2014 with special guests Adrian Sherwood and Mad Professor. These sound pioneers will join Dubspot instructor and Subatomic Sound System’s Emch and KCRW’s Jeremy Sole for a discussion on the history and evolution of dub, including how the genre of dub has manifested itself today’s contemporary music. This “Dub & Bass” workshop will focus on analog dub effects with a traditional mixing board and the mixing of deep bass frequencies of dub now commonly found in current electronic music. 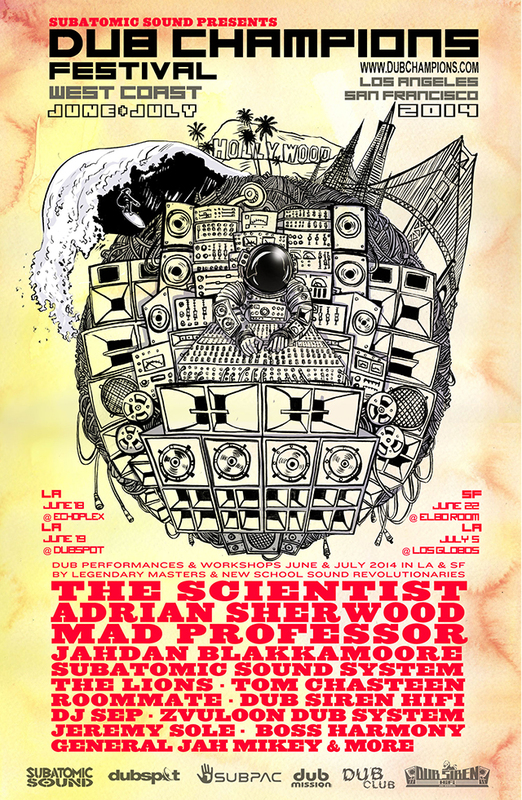 This will include a live Dub session by Mad Professor, Adrian Sherwood, and Subatomic. At this workshop, several SubPac devices will be set up to demonstrate the tactile experience of sub bass frequencies in a mixing environment to give a clearer picture of how the music will sound on a large sound system. Attendance is free. Please RSVP@DubChampions.com to attend. Seating is limited and will be on a first come, first served basis. After three years in the North East and two years in Europe, Subatomic Sound in conjunction with Dub Mission (S.F. 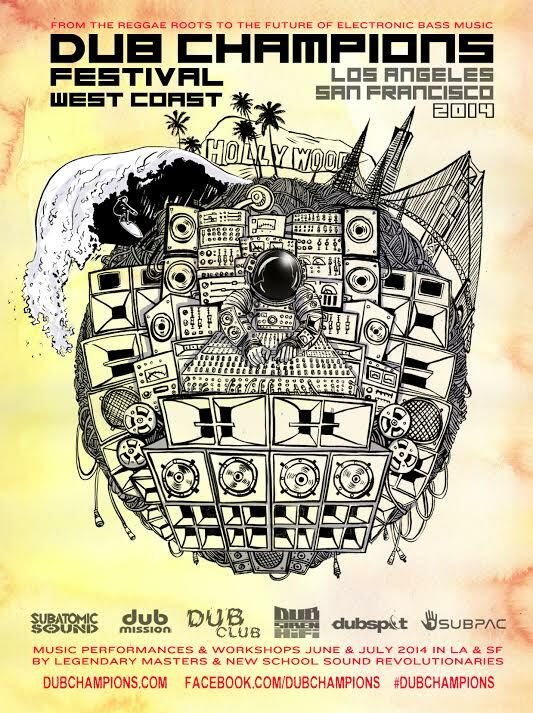 ), Dub Club (L.A.), and Dubspot presents the First Annual Dub Champions Festival on the West Coast. An international musical phenomenon, dub is a musical style characterized by heavy bass, drums, and copious use of effects, where the producer becomes the artist, with the mixing board as his or her instrument. The festival features performances and educational workshops to exhibit how the music is created and how it has evolved from its roots in ‘70s Jamaica to become a cornerstone of electronic bass music. Dub is a major inspiration to artists in many genres including rap, rock, punk and dance music. Dub Champions Festival was founded in New York City by Emch of Subatomic Sound System and is dedicated to featuring the world’s greatest dub pioneers from Jamaica as well as current innovators on every Continent. The festival happens in New York City, Washington DC, Philadelphia, Boston, Vienna, Amsterdam and now debuts in San Francisco and Los Angeles. In association with dublab, Red Bull Music Academy Panamérika will unite an array of forward-thinking Cumbia-inspired artists for a special night of music that will undoubtedly have those in attendance dancing non-stop. + Free Cumbia tote-bags screen printed live by HIT+RUN. NYC Open House: Sundays 11am & 12pm. LA Open House: Sundays 12-3pm. « Sound Design Course Preview, Q&A w/ Dubspot Labs Director Adriano Clemente – Courses begin 6/24 in NYC!